Matters of the heart are always tricky, and if you're having difficulty finding that special somebody who inspires you to do better and go after more of life, it's easy to get discouraged. But if you're ever feeling down and out about your love life, I can promise you that there's a surefire way to feel better: check out some of the relationship problems other people are having online. 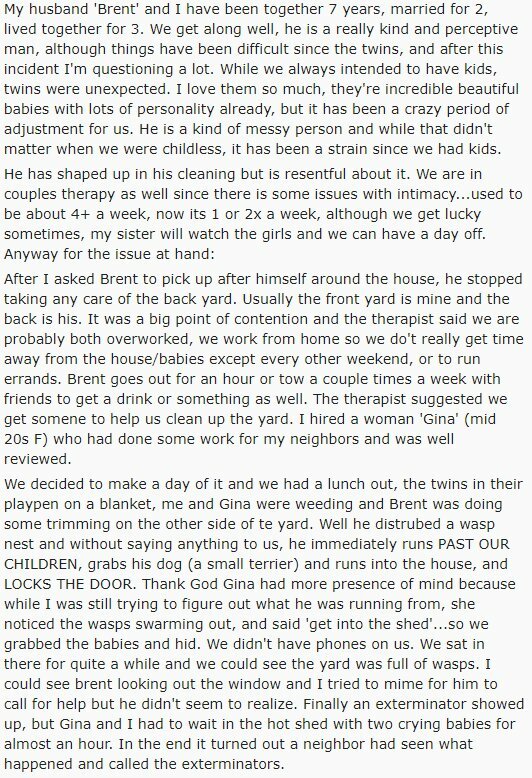 A good treasure trove of cringe-worthy, face-palming, and "what-were-they-thinking" action is r/relationships on Reddit. While there are several cases where people are obviously dealing with nuanced relationship matters requiring some seriously delicate advice, many others have a pretty clear solution. They're either blatantly silly or one-sided, or so outrageous that asking strangers on the internet for help is the last thing these people should be doing. Like this one woman who "overpowered" her partner during a play fight that brought up a lot of deep-seated issues in their relationship. 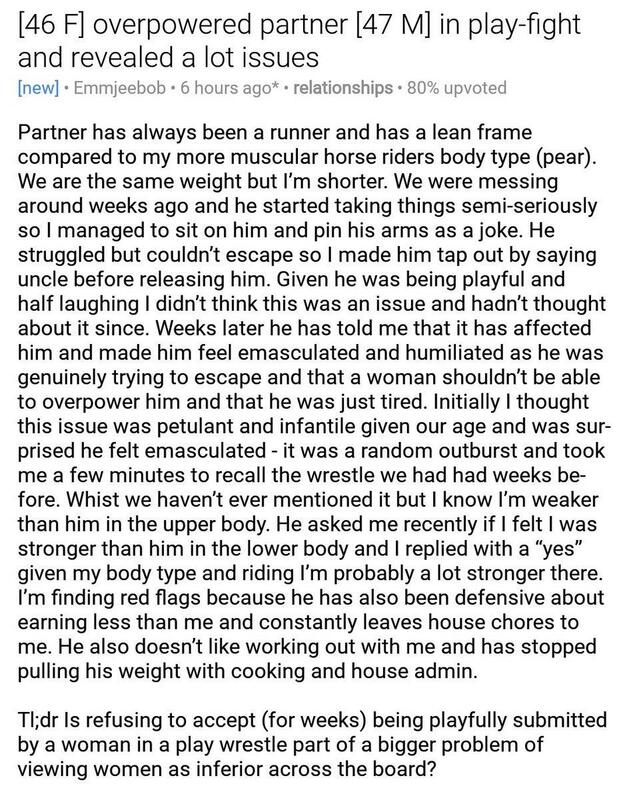 Turns out she "emasculated" him in a playfight after pinning him down with her legs on his shoulders, and in the aftermath of their fight be basically said he thinks women were inferior to men. Oh, and he also came up with a bunch of excuses for why she was able to "best" him so easily. Plus he feels insecure about "earning less" than her and leaves most of the housework and chores for her to do. It doesn't take a rocket scientist to see he's got some gender issues and feelings of inferiority to work through. As bad as that relationship problem seems though, I'd much rather deal with feelings of gender inequality and dominance than what this married couple went through. This new mother of twins noticed a change in her husband's attitude after the babies were born. Being a new parent isn't easy, and being surprised with twins can definitely be a strain if you aren't prepared, so his begrudging attitude towards doing household chores and not finding time for intimacy isn't that uncommon. But what about disturbing a wasp's nest and leaving your wife and two babies to fend for themselves while you save your dog and run inside? 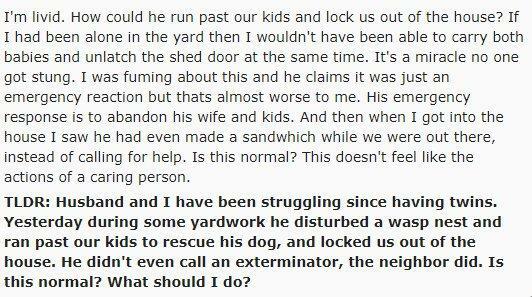 The worst part is that he locked them out of the house and, because this is an episode of Curb Your Enthusiasm, apparently, instead of calling for help he made a sandwich while his wife and kids waited in the shed. Help eventually came — not because of him, but because their neighborscalled an exterminator. 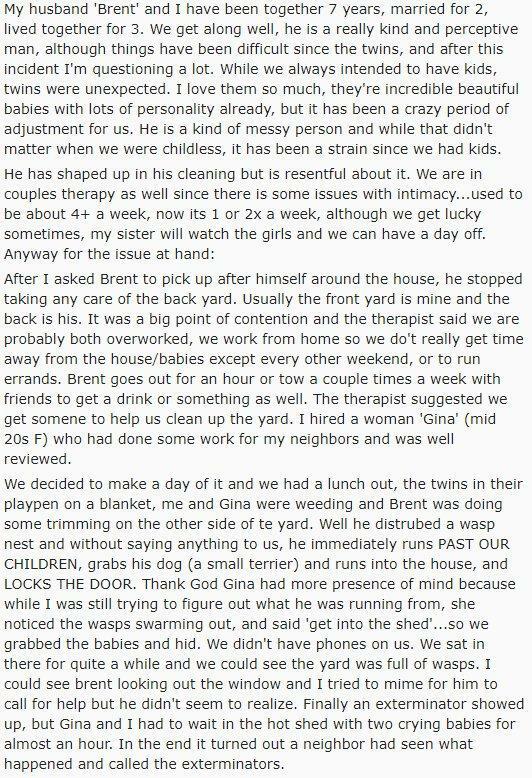 I'm no relationship expert, but it sounds like Brent has some hard facts to face about the state of his relationship. 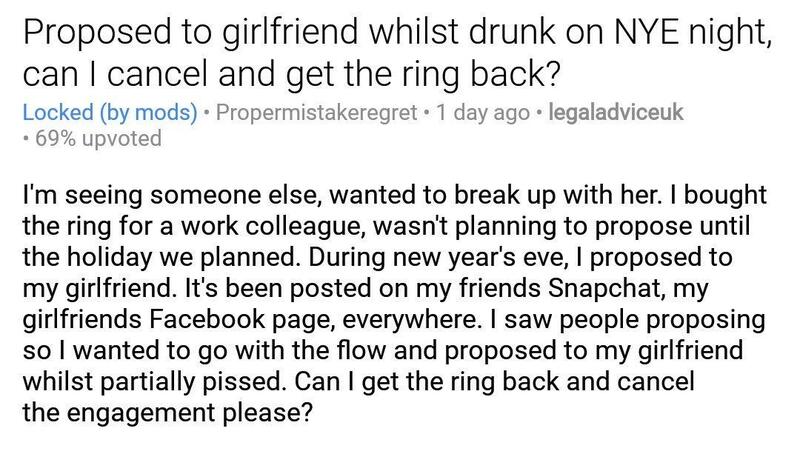 Some of the relationships were doomed before they even began, like this charming young gentleman who proposed to his girlfriend on New Year's Eve, then asked a bunch of strangers online if it was kosher to take it back, even though she shared the news with everyone online. Oh, and that's not the worst part: he was planning on breaking up with his girlfriend before proposing to her because he was seeing someone else. 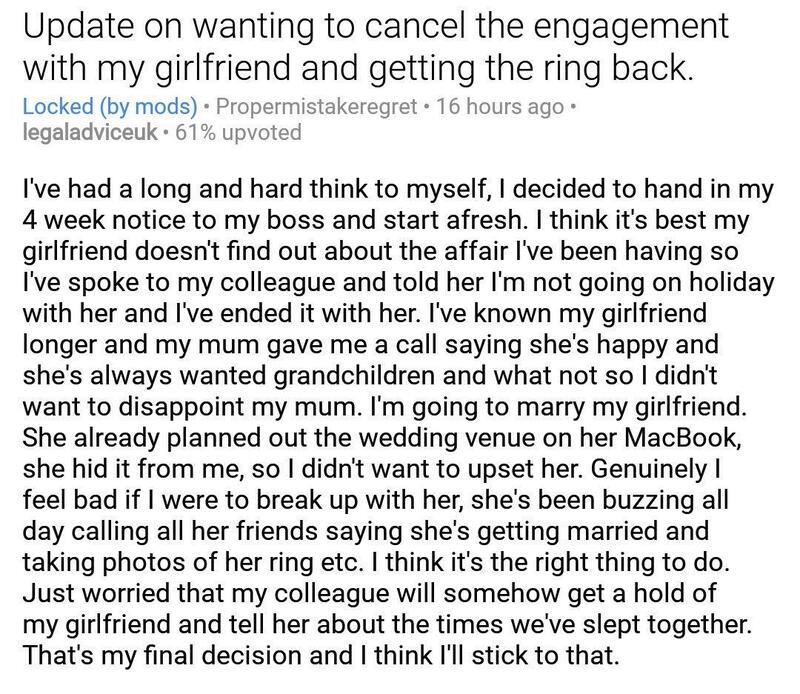 And then, as if it was an attempt to complete a life-ruining-choices-bingo, our protagonist in this sordid tale reveals that he's going to just "stick" with his girlfriend because she's really excited about the prospect of a wedding and had already saved some of her planning for it on her MacBook. 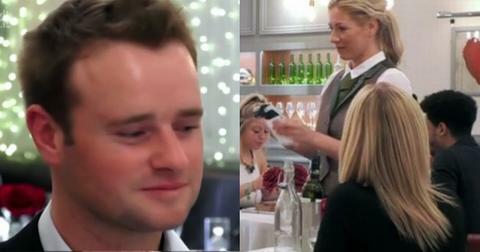 The only thing he's worried about is his work colleague calling her up and spilling the beans. Honestly, in this situation, I think it'd be the best-case scenario. That story was super depressing on multiple levels, so here's a more whimsical palette cleanser for you: this 32-year-old guy who is very happy about the friends with benefits arrangement he managed to set up for himself with a 24-year-old woman. 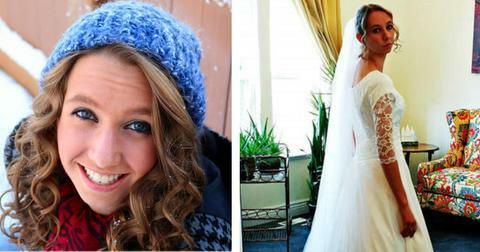 Apparently, she's great: opinionated, cute, intelligent, fun, adventurous in bed, but there's just one problem. She's messy. Because mr. muff_marauder on Reddit is a very concerned individual who wants to solve this pressing issue at all costs, he enlisted anonymous strangers online for some advice on how to make his relationship with this dream FWB even better. If only there was something that could be done to address her messiness issue. And by something, he means nothing that he has to do but something she must understand needs to be done entirely on her own. Something tells me their current situation won't last for that much longer, but a little clutter is nothing compared to this next one. One woman was shocked to discover her boyfriend of one year, who was really great and amazing otherwise, has audio clips of all his previous one-night stands. 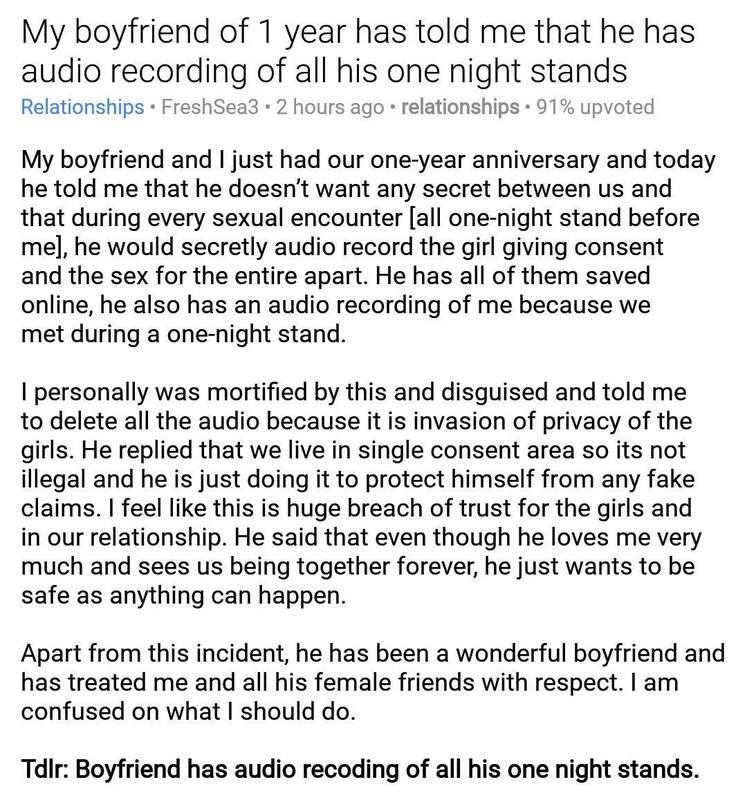 Her charming BF says that the only reason he did it was for "safety" purposes, and that he really does see the two of them together forever. But he won't delete the files, because, you know, he just wants to be on the safe side. 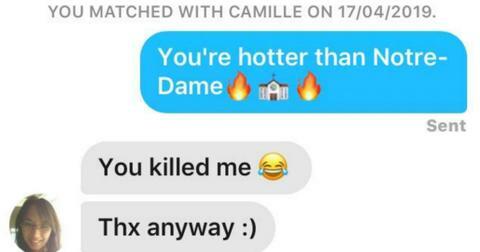 Feeling better about your relationship status yet?